A walk-off home run in the bottom of the 12th is a tough way to lose a game. But the Bulls parent club, the Tampa Bay Rays, one-upped them by losing in the bottom of the 15th out in Oakland. The Bulls looked to have the game in hand when they scored four runs in the top of the 2nd. Unfortunately, the Tides came back with five runs. After that the game mostly stabilized itself. The Bulls went ahead in the top of the 7th, but several pitching moves in the bottom of the inning didn’t work, and the Tides tied the game. Otherwise, the Bulls might have made it through. In the 10th Leslie Anderson pinch-hit for Evan Longoria, was hit by pitch, and later thrown out at the plate. Here’s hoping his hand is OK. He’s having a great season and I’d hate to see him miss any time. DHing Longoria struck out twice, but singled in one of the runs and drew a walk. In one of his more unusual moves, Montoyo put Jesus Feliciano in to pinch hit for Henry Wrigley after Anderson was hit by pitch in the 10th. Feliciano did manage to get the sacrifice bunt down (after two strikes) and move Anderson to second, but in the end the move didn’t pan out. In the end, Romulo Sanchez came off the DL and into the game. Got a ground out and a fly out and then gave up a home run. Tough loss. If you’re into grinding your teeth, please note that the Bulls have outhit the Tides in the last two games, 15-10 and 13-12, and lost both games. As mentioned, Romulo Sanchez came off the disabled list yesterday. Pitcher Bryan Augenstein went on the disabled list. He had a very long stretch on the DL at the beginning of the season. Let’s hope this is a short one. Rays blogger Tommy Rancel thinks the Rays may be looking to convert Cesar Ramos back into a starting pitcher. In spite of giving up 6 runs in the first ⅔ of the 1st inning, the Bulls actually had a clear shot at tying or going ahead in the top of the 9th. They were only one run down with runners on first and third when the final out was made. In fact, they had a very good overall game scoring 7 runs on 15 hits. 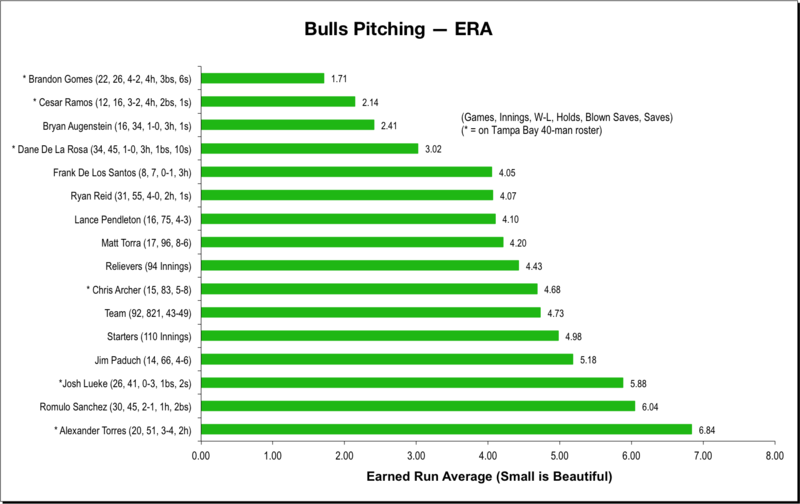 If there was ever a clearer example of just how much the lack of starting pitching has hurt the Bulls this year, I don’t know what it would be. The 1st inning tells the tale of the 2012 Bulls. The starting pitching put the team into a hole they simply could not dig themselves out of. 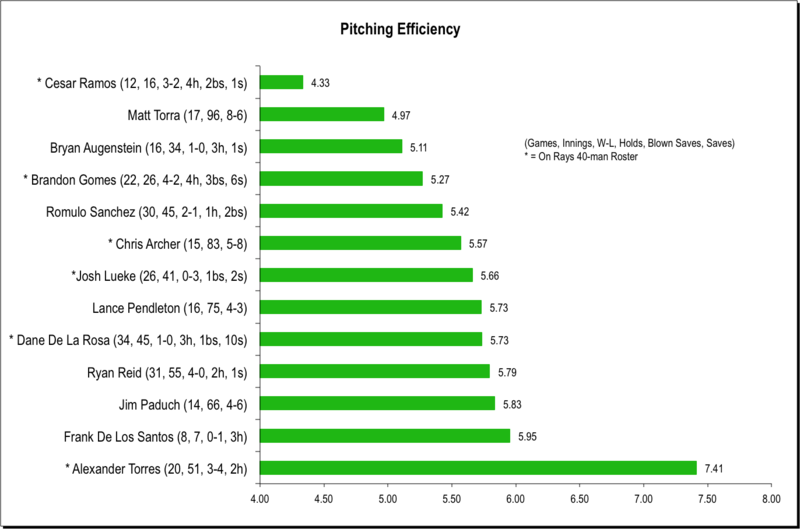 More specifically, Alexander Torres is not a good pitcher and has not been all year. It has me wondering about why the Rays are inflicting this on us Bulls fans. In his last five starts Mr. Torres has only gotten through a total of 13 innings. He’s given up 20 earned runs on 17 hits, 16 walks, 1 hit batsman, 2 home runs, for a stunning ERA of 13.85. The Bulls have ended up losing four of those five games. Torres was charged with the loss in three. Last night he left the game after two outs in the first inning. He’d given up three hits (two doubles and a single), hit one batter, walked three. Five runs had scored and there were two runners on when he was pulled for Matt Torra. One of those runners scored. 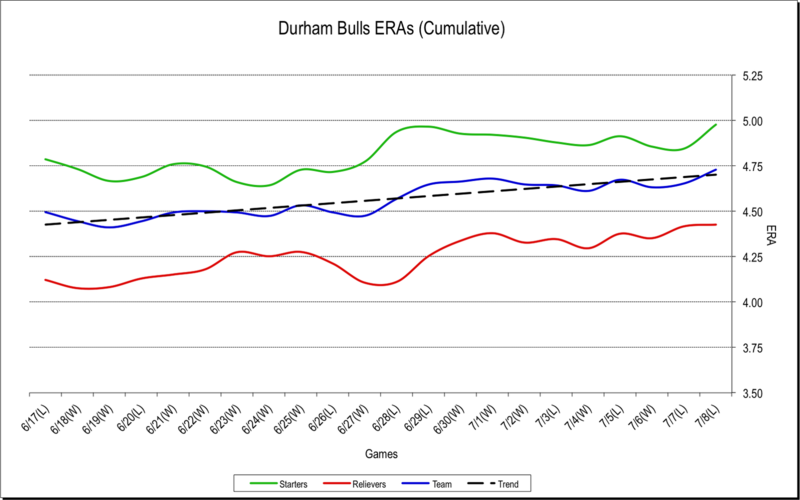 Any Bulls fan has seen plenty of pitchers who weren’t quite ready for either AAA or the major leagues, but I don’t think we’ve had to suffer through anything quite like this. Does he have an upside? Should he be pitching anywhere, for example A or AA? I don’t know. But here’s what I do know. I don’t have to go to a game that Mr. Torres starts. I don’t have to listen to a game that he starts. I know that the purpose of the minor leagues is player development, but I’m not quite sure what is being served by the pain we are watching/listening to here. Surely Mr. Torres has some potential. He would not be here otherwise. But for those of us who enjoy watching good baseball (and for those who are rightfully proud of the way they play baseball), surely it is time for him to try either a different team or a different profession. Starting pitcher trivia: This year the Bulls have had nine games when the starting pitcher lasted two innings or less. They lost seven of those nine games and the two games they won were oddities when the starting pitcher was a reliever on the front end of a “committee” game. So far rehabbing Even Longoria is 1 for 9 with a sac fly, 3 walks, and 2 Ks over three games at DH. For those interested in numerical anomalies we must note that the Bulls began this road trip by allowing their opponent to score 8 runs per game for three games in a row. 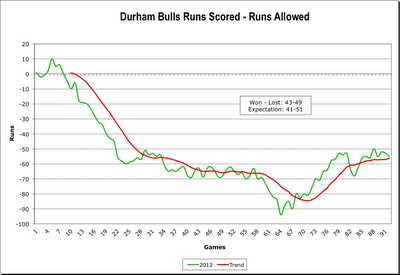 Fortunately for the Bulls, the Bulls scored more than 8 runs in the first two games (10-8 and 16-8). Not so fortunate was the third game when the Bulls only scored one run (1-8) and really not so fortunate for the fourth game when the streak was broken in a 1-13 blowout down in Gwinnett. After a trek across the Carolinas, the Bulls scored 8 runs for themselves over in Harbor Park, and the pitching achieved a rare shutout (only 7 shutouts in 109 games). Chris Archer continued his comeback from his muscle strain. Talk about being cautious: 17 pitches on July 7 (date twinge was noted), 41 pitches on July 22, and 60 pitches in 4 innings last night (July 28). I was not able to listen, but the stats look very good, only 1 hit, 1 walk, and 3 Ks. I guess I need to quit calling Frank De Los Santos a new guy. He has become a bright light in the bullpen. When he came up from Montgomery on June 22 he was handled as if he were going to be a lefty specialist. Possibly making a virtue of necessity, he’s been having mostly longer outings recently, picking up two holds and two wins in his last five outings. He’s up to 14 appearances, 17 innings, a 1.38 FIP, and an ERA of 1.58. Here’s hoping he stays healthy to the end. 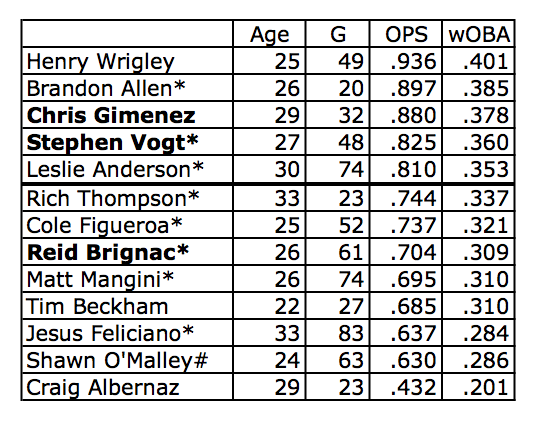 With his single and double last night, Henry Wrigley moves into some interesting company among fellow Rays prospects. The mystery of Brandon Allen’s trip to the inactive list has been solved. Apparently he is off to Japan. Too bad. I thought he showed a lot of potential to help the Bulls this year, even if there’s a crowd at first base. I missed the last couple of games, thank goodness. Has anyone heard what the story is on Matt Mangini? Last time seen in a game on 10 days ago, he’s been on the inactive list since. The mystery of Alex Torres continued in the first game of this series with the Gwinnett Braves (1⅓ innings, 2 hits, 6 BB, 5 Ks, 5 ER). However, Brandon Gomes, new guy Frank De Los Santos, and Bryan Augenstein sucked it up for the rest of the pitching crew. 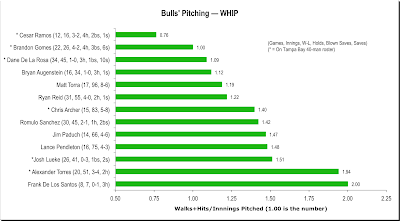 Meanwhile, Bulls bats were very active, but not too impatient (7 walks). The swings back and forth meant that the game was never quite put away for either team. In yesterday’s game Lance Pendleton gave up 10 hits and 8 earned runs and still got a win! Which implies that, overall, this was a game of their pitchers being far worse that our pitchers. Bulls batters drew 11 walks, got 14 hits, and scored a season-high 16 runs. They jumped out to a 7-run lead, gave it back, and then went ahead on Reid Brignac’s grand slam. Even a baseball professional has got to feel extended after a 4¼ hour and a 3½ hour game. That’s a lot of time keeping your focus on track and might help explain the 7 errors the two teams have accumulated over the two games. Evan Longoria is supposed to show up in the Bulls dugout today. I have to say I have mixed feelings about this. Based on the comments here, he sounds fragile. He’s only going to help the Bulls if his bat gets hot (a possibility). The Rays gave up a rising AA player, Tyler Bortnick, to get yet another infielder, this one from the Diamondbacks, Ryan Roberts. The interesting note, from a Bulls fan perspective, is that Bortnick was immediately assigned to a AAA team. Has the glut of middle infielders on the Bulls roster been holding Bortnick up? Former Durham Bull Hideki Matsui has been designated for assignment to make room for Roberts. Although immediately off the Rays roster, Matsui has a couple of days to make up his mind/consider offers/negotiate with the Rays before a final move has to be made. Interesting interview with Bulls pitching coach Neil Allen on the Bulls website. Remember Robinson Chirinos? He is still rehabbing from a concussion caused when a Josh Lueke pitch got foul-tipped into his mask during spring training. Here’s an insightful look at coping with an invisible injury. This was one of the most fun-to-watch Bulls games of the year. Were there mistakes? You bet. But there were also a couple of brilliant defensive plays, decent pitching, a timely home run by a fellow just back to the team, and a win against one of the best pitchers in minor leagues. Just plain fun. Oh, and the Bull is partially back in service. After starter Matt Torra called in sick, Charlie Montoyo had to go with an all-reliever approach to the game. He kept with his disciplined approach to his lineup, however, sitting out Reid Brignac, Brandon Allen, Leslie Anderson, and Sam Fuld (or maybe Fuld’s gone back to Tampa Bay). First of all, of course, was the obligatory rain delay, this time just half an hour. The tarp crew has earned they pay this week. Ooops! They don’t get paid for pulling the tarp? How fair is that? Montoyo started with Ryan Reid, who’d done a 20-pitch inning on Sunday night. Reid gave up two doubles and a walk, but they all ended up standing on the bases. Meanwhile back-to-back doubles by Tim Beckham and Jesus Feliciano in the 2nd inning put the Bulls up 1-0. Nevin Ashley, starting as catcher with catcher Chris Gimenez in left field and catcher Stephen Vogt at first base, had his first at bat as a Bull since April 27th in the bottom of the 2nd. He flew out to left, but it was great to see him back in the game. For the 3rd, 4th, and 5th innings it was Josh Lueke’s turn. He got past a few messy moments, including his own throwing error in the 4th (where Ashley backed up first base and ran the loose ball down almost to the bullpen — I said it was a fun game to watch). He struck out four and stranded one more. He was also supported by a spectacular running, diving stretched-out catch by Rich Thompson in right for the second out in the 5th. Beautiful, beautiful play. Meanwhile Rochester’s Liam Hendriks was showing his stuff, including two strike outs looking to end the 5th. New guy Adam Liberatore came out for the 6th and 7th and had an ugly stretch after giving up a leadoff single followed by a K. He threw seven straight balls before putting strike across and then getting the second out on a liner to centerfield and then a K with runners on second and third. He didn’t have any problems in the 7th at all. Meanwhile in the Bulls 6th Henry Wrigley drew a walk in the 7th, moved to third on a Vogt double and came home on a wild pitch. Vogt moved to third on that same wild pitch and came home on what should have been a sac fly by Cole Figueroa, but the ump blew the call. The baseball gods made it right in the 7th when Nevin Ashley hit a two-run home run off the Rochester reliever. The 8th and 9th were Dane De La Rosa’s turn and, although he made it exciting, we fans were rewarded with a spectacular Rhymes to Beckham to Vogt double play to end the game. Beckham seemed to leap straight up into the air to avoid the incoming baserunner while making a perfect throw to first. Pretty, pretty, pretty. OK, this year’s Bulls may not be the best team in the league, but every now and then we get to see an exciting game. That’s why we go, isn’t it? The story on the grass is, essentially, what would you do if it was 105° for a couple of days in a row? And you just had to lie there and take it? You’d turn brown and die wouldn’t you? All to be made well while the Bulls are on their trek to Lawrenceville and Norfolk. Rays Index does some interesting number-crunching regarding the Ichiro trade. Did the Yankees just waste a couple million more dollars? Will anyone notice? First, let me admit that I watched the first game at the DBAP and the second on TV at home, so I missed some of the pain and fun of yesterday’s games. Jim Paduch pitched pretty well in the opener, the home run to Clete Thomas being his only big mistake. The rest of the runs were gifts to the Red Wings by the Bulls infield. Sam Fuld looks ready to play the outfield for Tampa Bay, even if his bat and running shoes may not be. He handled a lot of plays in right field in game one, at least six outs and two singles in front of him. He made a terrific throw in the 4th to stop a Red Wing from stretching a single. At bat in his time with the Bulls so far he’s only gone 3 for 18 with a double, 3 walks, 3 Ks, and was thrown out in his one steal attempt. At .167 he’s done better that some rehabbers who’ve come through this year (Lobaton, Joyce), is tied with Jennings, and lags Longoria’s 1 for 5. If he plays tonight, it could be his last game with the Bulls. A very scary moment came in the 5th when Stephen Vogt chased a foul ball into the brick wall near the Bulls dugout. Could not tell if he’d hit his head or his shoulder, but pleased that he was able to stay in the game. Did note that Nevin Ashley started to put on the gear for a few minutes there and Ashley was seen trotting down to the bullpen in Game 2. Chris Archer looked terrific in his first inning of Game 2, OK in his second, and a little shaky in his third. I hope the trade rumors are wrong. I’d really like to see him back on form and able to really get into a game for the Bulls. Undoubtedly the best pitcher the Bulls have, when they have him. Rich Thompson’s talent is rattling the opposition with great baserunning. He did that to win the second game. Bunt single, stolen base, perfect tag-evading slide into home on a Henry Wrigley single to win the game. Just terrific. 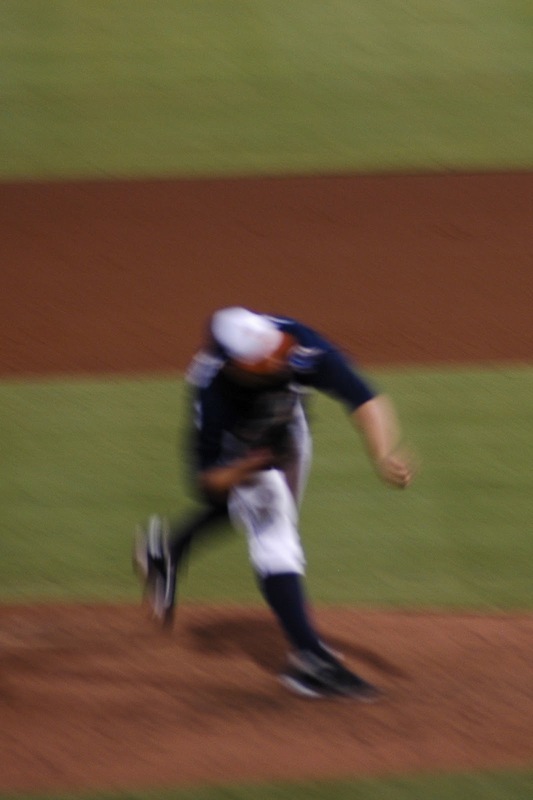 Just up from Montgomery Biscuits reliever Adam Liberatore made a one batter/two-pitch/blown save appearance. That goes with his four batter/thirteen pitch appearance back on April 14th. He remains the leading candidate for the 2012 WDBB Moonlight Graham Award for pitchers. Brandon Gomes has been optioned back. Former Bull Matt Moore went a bunch of innings in yesterday’s loss to the Mariners, so he was not needed. Guess it made the folks down there feel better having him on the bench. No telling how Gomes feels about his 1,400 mile trek. Indy Week writer Adam Sobsey has been optioned back as well. He returns with an assessment of the 2012 Durham Bulls up at the Indy Week link. A bit of tough love there. As most probably know, the Bull (and the scoreboard) took a lightning strike the other day. Hence the quiet response to Anderson’s and Vogt’s home runs yesterday. Repair parts are being Fedex’d to the DBAP. Repairs done by tonight? Maybe. In the meantime, let me repeat my appreciation to the scoreboard guys for figuring out how to keep us informed regarding balls and strikes. Now if they could just help me out with the illegible uniform numbers … (yeah, I know I’m old, but when Jesus Feliciano (23) made it to first I was hard-pressed to tell the difference between his uniform number and Charlie Montoyo’s (25)). Those jerseys do look comfortable though, I just don’t have the $95 it’d take to buy one with my name and an illegible number on it. Just in: Jeff Manship, the Red Wings pitcher who got the win against the Bulls in the opening game, has been named IL pitcher of the week. You are probably as tired/confused as I am, but as the infomercial says, "Wait, there's more!" Nevin Ashley (Remember him? Catcher? Played in a couple of games at the beginning of the season) is off the disabled list and due back. Tonight? Don't know. Pitcher Adam Liberatore has been called up to the Bulls from Montogomery (We've saw him early in season. Infielder Shawn O'Malley has been sent to Montgomery (Too bad. I like Mr. O'Malley. He'll be back someday). That's six, count 'em, six roster transaction affecting the Bulls today, and that doesn't count Mangini and Albernaz or what may happen if the Rays' Alex Cobb isn't able to make his next start. Oh, what the heck ... bottom line, the Bulls now have two holes in their bullpen being filled by catcher Craig Albernaz as they face two games today! Good luck guys! The Rays have put DH Luke Scott on the DL. (Remember him? He came through Durham a few weeks ago.) That allows them, conveniently, bring up a reliever after a 14-inning game yesterday. Funny how that works. Cesar Ramos is on his way to St. Petersburg. To take Ramos' place on the roster catcher (and infrequent pitcher) Craig Albernaz is on the way back from Hudson Valley. Update, 10:00 pm, 21 July: Ramos must have been called up Friday night, because when Alex Cobb was injured in 2nd inning of tonight's (Saturday's) game he came in and pitched a solid four innings in relief, 2 hits, no runs, 6 Ks. He might stay there with that kind of performance. The Rays, however, couldn't score against the Mariners and lost 2-1. Update, 8:00 am, 22 July: Ramos has been optioned back to Durham and another pitcher will be recalled to take his place, according to reports. This is really going to screw up the Bulls bullpen. Short one pitcher when Ramos left, another being called up, facing a double-header today. And Ramos, as I understand the rules, can take several days to return. Will Rhymes returned to the Bulls in style. Batting leadoff on the second pitch of the game he hit a home run. Welcome back! The inning continued with a double by Henry Wrigley (have I pointed out what a great season he’s having?) and another home run by catcher Stephen Vogt. When the rains came at the end of the 5th inning we could reasonably hope that the game was over with the Bulls ahead 4 to 1. But noooo, the umps were better weathermen than that (and the DBAP folks probably wanted to do their fireworks thing). That meant that after a 45 minute delay, even though the Bulls added two more runs in the 7th, when Bryan Augenstein had an uncharacteristically tough time in the 8th, the lead got down to just 6-3 and I was worried. Enter Dane De La Rosa who gave up a double and a single to start the 9th. With runners on first and second, Tim Beckham playing second base made a spectacular play on a foul ball that was near the bullpen pitching mound for the first out, but a run scored. De La Rosa gave up a single, but struck out the next batter. Runners on first and second, tying run at the plate. A long fly ball to left field and rehabbing Sam Fuld with his back right against the Blue Monster made the catch to end the game. Other game high points were Brandon Gomes coming back after the rain delay (he made two pitches before the deluge) for two solid innings; Frank De Los Santos doing his left specialist thing for the last out K in the 8th (with runners on first and second); pitching and good defense stranding 14 Red Wing runners. A careful reader has pointed out an error that I need to correct. A few days ago I complained that the local media was not digging in sufficiently on Chris Archer’s physical situation and on Brandon Gomes’ poor performance on returning from the Rays. Well, in fact the Herald-Sun had reported on that situation. Not only that, I had even put up a link to the article! I can’t say something dumb like that won’t happen again. But I can say that if it does I will try to fix it. Speaking of Chris Archer, he is supposed to start tonight. His last time on the mound of the DBAP was June 8th (he’s had three minor league and two major league starts since then, he just hasn’t been here). He was only up for an inning in his last start down Gwinnett on July 7, so I’m looking forward to seeing him here. One reason to want to see Archer now is all the speculation afoot regarding the Rays these days. If the Rays do make a move, you have to think that Archer will be part of the equation. I was at the game with a bunch of friends last night. Among them were a couple of Phillies fans. They had a good time and I was, I think, happy for them. As has happened many times this season, the International League’s worst pitching staff put the Durham Bulls in a hole they couldn’t climb out of on Thursday night. Alexander Torres really is not improving as the season goes on. The Iron Pigs jumped on him early and often, driving Torres off the mound after just three innings with five runs on five hits, three walks, two stolen bases, and a wild pitch. Josh Lueke kept things in check for a while and there was occasional glimmers of hope. But the Bulls left most of the hope standing on the bases (9 of them). Die hard fans got to see a couple of nifty plays in the 8th (I wasn’t one of them. I was home watching on TV). An Allen to O’Malley to Gimenez play prevented a run; a catch of a line drive by O’Malley led to a double play to end that inning. Things really came apart in the 9th, however, and Montoya was not going to waste a pitcher on a lost cause. Romulo Sanchez let four more runs across, including a bases-loaded hit-by-pitch. No help was going to come in to save him. 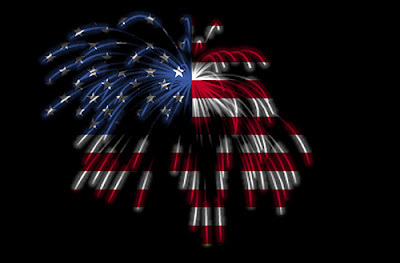 Nevertheless, we should not take anything away from the Iron Pigs. They are a very good team. 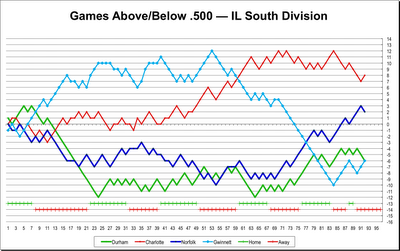 They lead in what appears to be the tough division of the IL this year. If their pitching can be a bit shaky, they are a heck of a lot better than the Bulls and their bats are not shaky at all. No reason to think that they couldn’t be in the Governors’ Cup this year (unless the Phillies strip them out in September). The Bulls can be modestly proud of a season 4-4 split with them. Kudos to the video board guys at the DBAP. An early evening lightning strike messed up the only electronic stuff on the old-fashioned manual board: the ball, strikes, outs, hits, and error lights. Within a inning or so, somebody figured out (or already knew) how to modify the video board to display the balls, strikes, and outs and kept us informed through the rest of the game. Great job! In fact, the information on the video board has been impressive all year. Almost every home stand has seen some tweaks and improvements. There was more bike rack controversy last night, this time from the top of the Blue Monster. From my seat, however, the ball seemed to hit that plexiglass in front of the railing and simply bounce back, a live ball by DBAP ground rules. Bulls relievers pitched one-hit, shutout ball for the last 4⅓ innings and the Bulls held on to a 6-4 lead. Terrific! We have to thank the Iron Pigs for the two unearned runs. But that’s OK, they got the freebie home run call. Infielder Cole Figueroa was the batting hero with three RBI and he rightfully gets some attention in the Herald-Sun and Indy Week reports. Check out the links above. A small side story this week involves Bulls outfielder Rich Thompson and Iron Pigs outfielder Kyle Hudson. At the beginning of the season Thompson was a long-serving veteran on the Iron Pigs roster and Hudson was a newcomer for the Bulls. But several weeks ago the Rays needed a temporary outfielder right away and the Phillies were apparently looking for a long-term possibility. So the Rays and Phillies traded. Hudson went to the Iron Pigs and Thompson went to the Rays where he played for a couple of weeks (appeared in 9 games). 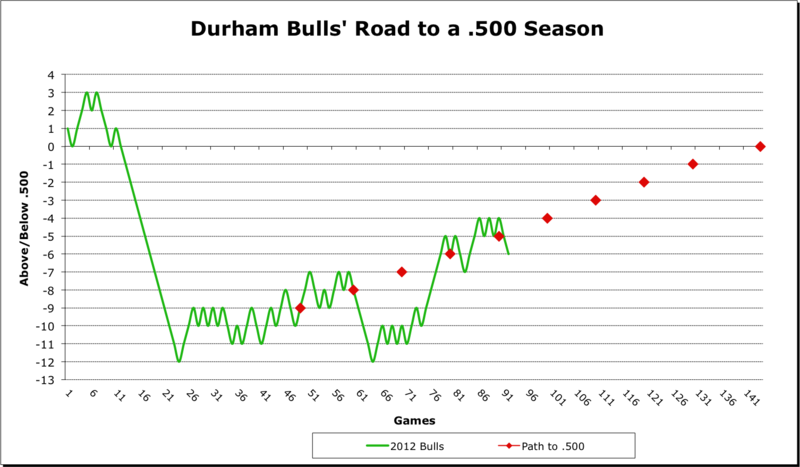 Thompson then came to Durham and has now played in 29 games as a Bull. Both batters have been batting leadoff in this series. Hudson is 3 for 13 with a RBI and a run scored in three games. Thompson has led off in two games and is 1 for 10 with a run scored. Looks like the match up is going Hudson’s way, so far. What’s happened to the playing field? It looks just awful. Has anyone had a chat with groundskeeper Scott Strickland? If so, please pass on. No word yet on who will be pushed out for incoming infielder Will Rhymes. Last night saw yet another controversy involving the “bicycle racks” on top of the outfield walls in center and left. Isn’t that a fixable problem? Or is it an umpire training issue? This time the call went against the Bulls, although they have gone in the Bulls favor in the past. Although a Rays’ blogger might have considered yesterday a “run of the mill day”, for the Bulls and Bulls' fans it was a really big deal to break that awful 7-game losing streak. 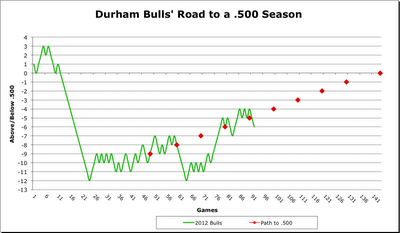 The Bulls are hanging on by their fingernails at the edge of a statistical abyss, but there’s hope. The hero was Jesus Feliciano whose 4 RBI from the number 9 spot made all the difference. The oddity was catcher Stephen Vogt batting leadoff. Vogt was 2-4 with a walk, an RBI, and a run scored. He made Charlie Montoyo look really smart and it did look like a great move. Dane De La Rosa came out of the pen and redeemed himself from his awful inning up in Charlotte, although he was still really wild. Lehigh Valley came to swing for contact last night. They did not draw a single walk the entire game. But they didn’t strike out either. The only freebie came when Jim Paduch hit a batter. Kept the infield and outfield very busy. 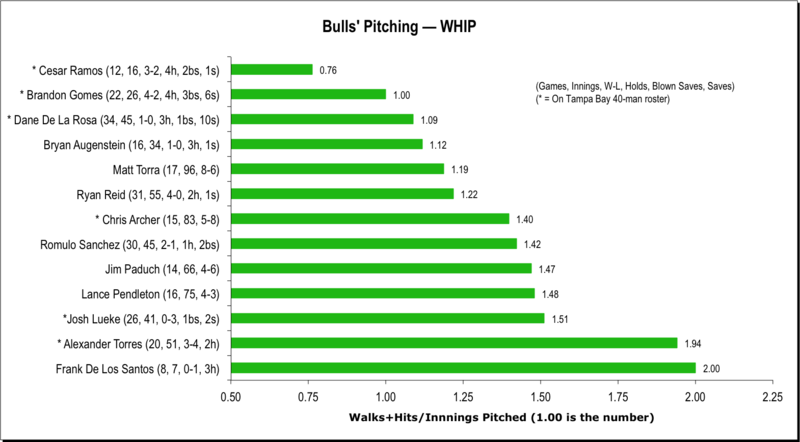 The Bulls have had a couple of no BB nights this year, but I’m pretty sure it was the first no-K night. And now for a modest rant. I mostly like the Bulls new broadcaster Patrick Kinas and I like the depth and humor that John Manuel of Baseball America and Scott Pose bring to the booth. What I don’t like, however, is when they get so deep into story-telling that they get away from what I need as a listener — play-by-play, the basics of what’s happening on the field. All too often the play is over before Kinas even tells us what’s happened. We often don’t know whether the batter (or pitcher) is left or right handed or where the fielders have been positioned, or where the runners ended up after a play. Late in last night’s game both Manual and Kinas were wondering why a Bulls’ batter was walking back to the dugout. Well, he’d struck out, but Kinas and Manuel were so deep into arcane trivia (I think it was the top picks of the 1994 draft) that they didn’t notice. Come on guys. If I’m not at the game and I’m not watching on TV, you’re all I’ve got. You’ve got to draw me a picture and you know how to do that very, very well. But you don’t always do it. This is radio. Especially when the Bulls are on the road, you are all I’ve got (MiLB.TV is mostly terrible and a waste of money). Word pictures first, stories second. The Tampa Bay Times is reporting that infielder Will Rhymes is on his way back to Durham. That's creates a puzzle for the Bulls that's probably already been solved. Just for grins, though, who do you think is leaving and where will he go? 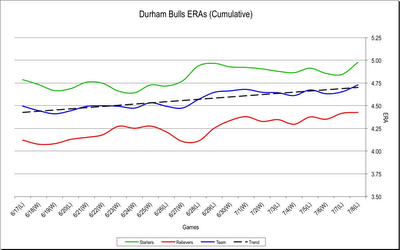 Rhymes' last at bat as a Bull was on April 30th, so it's been a while since he was in Durham. We never knew his exact contract status, but sounds like he has options left and has no real choice. As a Bull he played 17 games at 2B and 5 at 3B. The Bulls have Matt Mangini, Reid Brignac, Cole Figueroa, Tim Beckham and Shawn O'Malley cued up for those locations. Just glancing at that list, it sure looks like Mr. O'Malley (who's been seeing some playing time in the outfield) will be on his way back to Montgomery. After perhaps ten minutes into the game the Bulls were behind by three runs. Probably a good time to get philosophical about it all and just watch for interesting plays. We haven’t been able to go to a ball game for almost two weeks because of the bizarre schedule this year, so just enjoy the moment. At least that what I kept telling myself last night. It actually helped … a bit. Sam Fuld, a Rays outfielder, is in town on a rehab assignment. In the 5th inning he got to help the grounds crew adjust a sign in center field that was apparently bothering a Lehigh Valley batter. Didn’t help. The batter, Andres Blanco, hit into one of the three nice double plays the Bulls pulled off in the game. Too bad we don’t have some more aggressive reporters here. If we did, we might find out what happened to Chris Archer and Brandon Gomes. Gomes is pitching poorly and Archer isn't pitching at all. 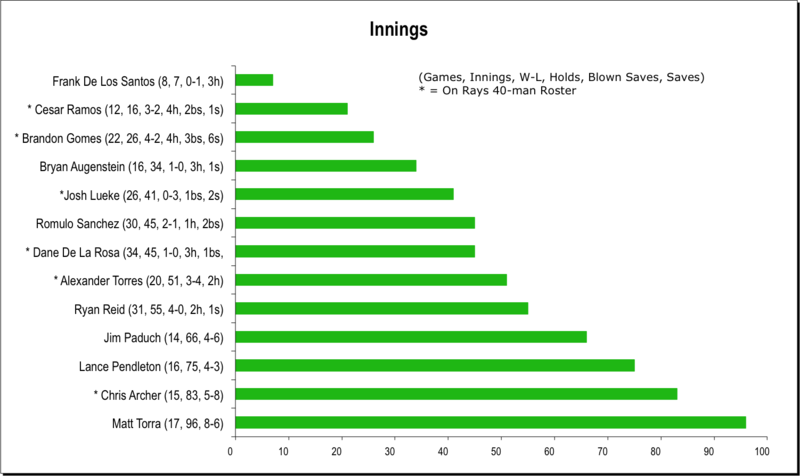 Archer went up to the Rays and started two games for them (and did pretty well). He came back to the Bulls and pitched one inning (17 pitches) back on July 7th and hasn’t been back on the mound. We can guess that it is some sort of physical distress, but you can bet that if he were still on the Rays roster we’d have more information than we do here. So, whatever might be wrong, Chris, here’s hoping that it’s not anything serious and that you’re back soon. 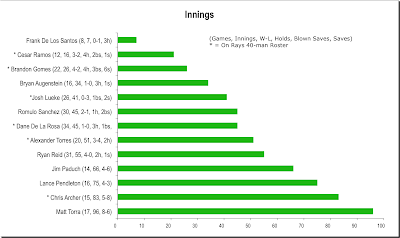 In Archer’s absence Ryan Reid got a spot start last night and, except for an unfortunate home run, did OK.
Brandon Gomes has been up with the Rays three times this year and is having trouble getting in his innings after coming back the last time. Since July 2nd he’s only pitched in 3 ⅔ innings. It caught up with him last night when he was hit hard for three runs. Meanwhile, the Iron Pigs’ Tyler Cloyd simply handled the Bulls. Tricky, crafty guy. Glad the Bulls don’t have to face him again this season. Update: I wouldn't post this if the Bulls were more forthcoming. But there's this rumor out there. What if the Rays are looking to trade Archer? Is that why he isn't playing? Before the game Broadcaster Patrick Kinas noted that this series would be a matchup between the best and worst ERAs in the International League. In his pre-game interview, Manager Charlie Montoyo said that starting pitching was his biggest concern, but that he was pleased at how well the Bulls were able to come back in recent games. Jim Paduch gave up five runs in the first inning. The Bulls got 4 back. Not enough. Over the break the Rays released Bulls outfielder Jeff Salazar. Too bad. From a fan’s perspective, Salazar was a really interesting guy to watch. His numbers weren’t all that impressive and he was fighting for playing time in the last couple of weeks. Stephen Vogt came off the disabled list and Craig Albernaz was “sent to Hudson Valley”. A blogger has some good things to say about Tim Beckham, and he does have a lot of potential. But he had a couple of big opportunities last night and didn’t come through. Oddity: Not one position player on the Knights’ roster is on the White Sox’s 40-man roster, but 9 pitchers are (two of those pitchers are on the DL). Rays Prospects has updated their analysis of hitting prospects. 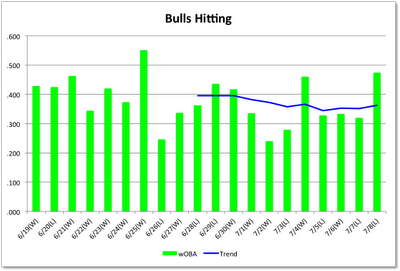 Hitting, power hitting, has usually been a Bulls strong point. Not so much this year. This year the Bulls have done OK hitting for average (at .266 they are second in the IL), but not so well on power (7th in the league on OPS). Since mid-season, however, things have been looking up. They have won 12 out of the last 20 games and, since it obviously wasn’t pitching, it must have been 1) hitting or 2) opponents’ pitching or 3) both. The first chart plots the game-by-game weighted on base average, wOBA, for the team, with a trend line. The trend, buy the way, is a ten-game moving average. 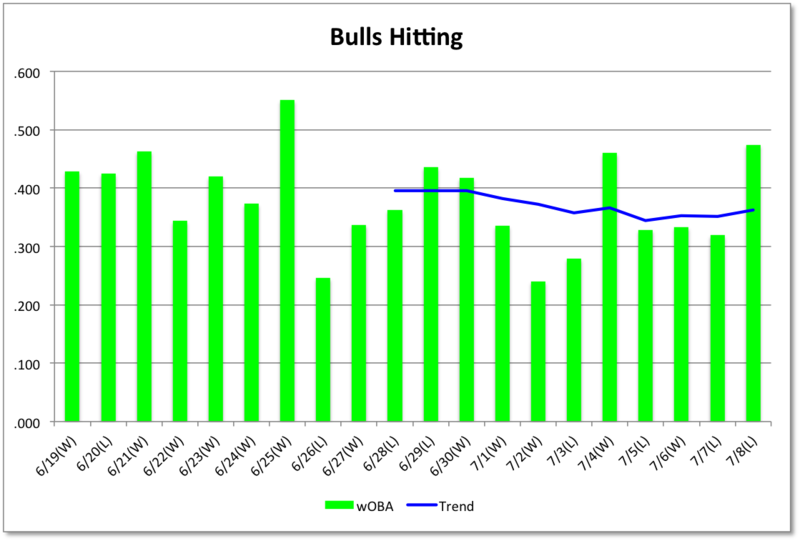 Since a .400 wOBA is considered really good, its safe to say that the last several games have shown stellar hitting on the part of the Bulls. Similarly for individual players. As the season has progressed, more and more players seem to be getting into their stride and some, notably the top five in this list are starting to shine. A wOBA of .340 is considered “excellent”. Players in bold are on the Rays 40-man roster. While we’re waiting for real baseball to re-start, time to look at some charts. First of all, how are the Bulls doing in the International League South Division? Better than they were, but still a ways to go. After Gwinnett fell off it’s perch a couple of weeks ago, Charlotte established itself at 8 games above .500 and has a 3 game lead over Norfolk. The Bulls missed a chance to gain on the Tides and push the Braves deeper in the hole last weekend. They are tied at 6 games below .500 and 7 games back of Charlotte. The Bulls come back from the break with a 4-game series in Charlotte (hint, hint). Standings. 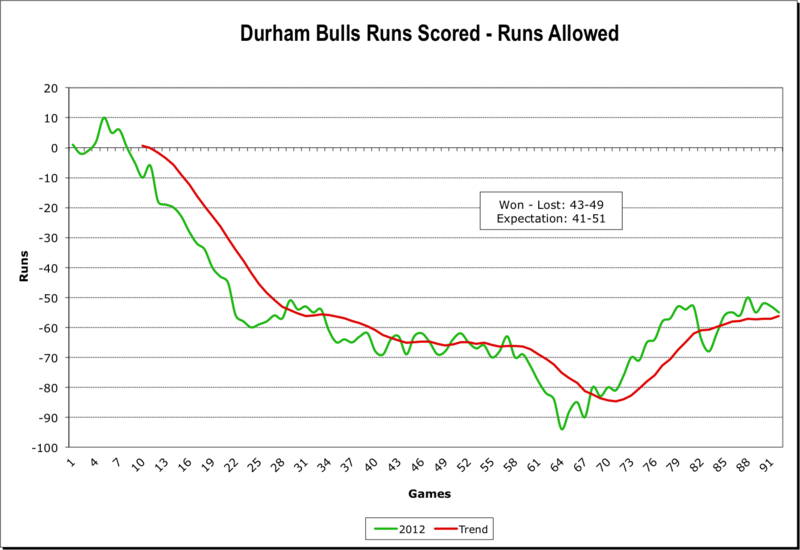 In the runs scored-runs allowed metric the Bulls are in an ever-so-gently-upward slope. That’s good. The Bulls also continue to outperform their Pythagorean Expectation, an indicator of good luck and good relief pitching. 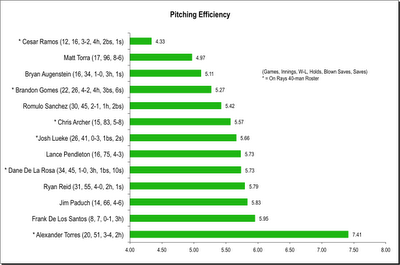 As we’ll see in the pitching charts (another day), that’s also good, because the starters need some help. Note: The trend is a 10-game moving average. 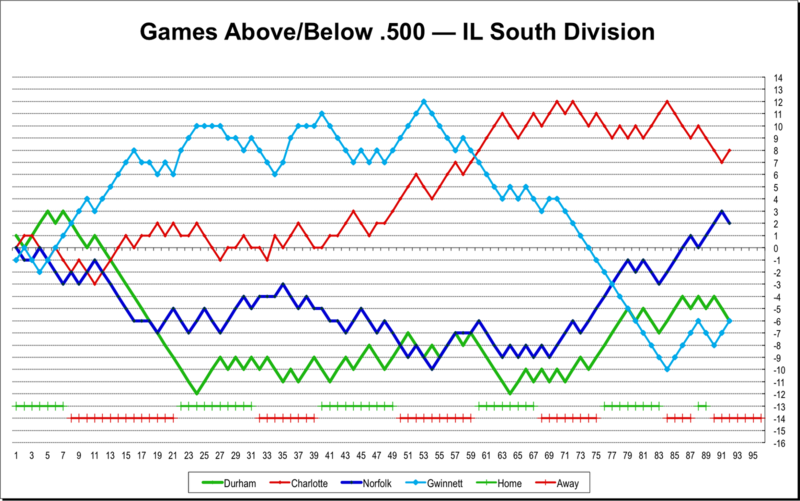 How about the Road to .500, WDBB’s hope for the 2012 season? This is a very demanding challenge for the Bulls. They had done a terrific job of getting back on the path until the last two games in Gwinnett. The math is tough. They have 48 games left in the season (27 at home). They need to win 29 of those games. That is, they need to play .600 ball for the rest of the season. Meanwhile, how about that bunch that plays in the bandbox near the bay between Clearwater and Brandon, Florida? That would be the Tampa Bay Rays, the "parent" club of the Durham Bulls, who play in the American League East. If the Yankees weren’t running away with the division you’d say pretty good. 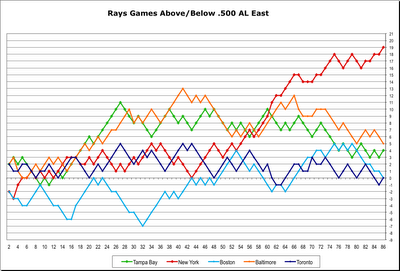 But the Rays have only played 86 games (to the Bulls 92) and are only at the half-way point. The Bulls are 20 games past their season’s halfway point. 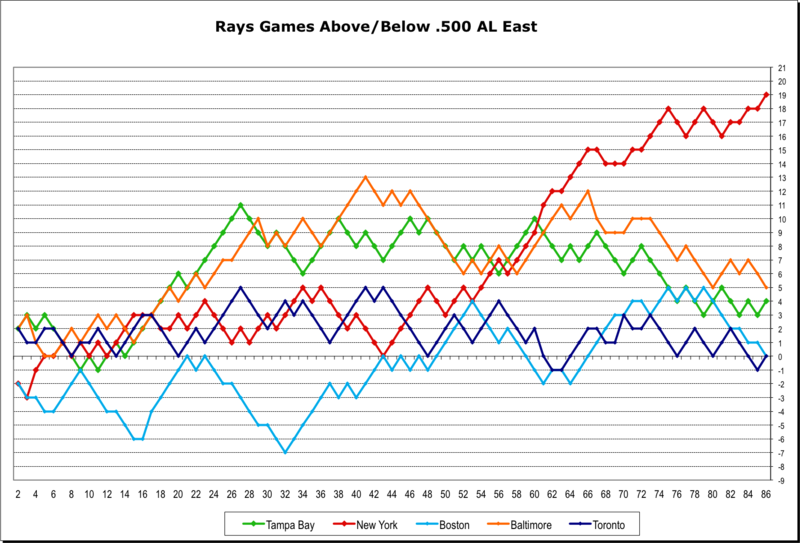 So, the Rays are definitely in the hunt for the 2012 season. At 4 games above .500 they are doing OK. 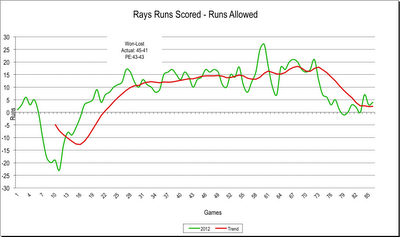 In the runs scored-runs allowed charting, the Rays may be recovering from a pretty disturbing downward path. Rays fans should hope so. 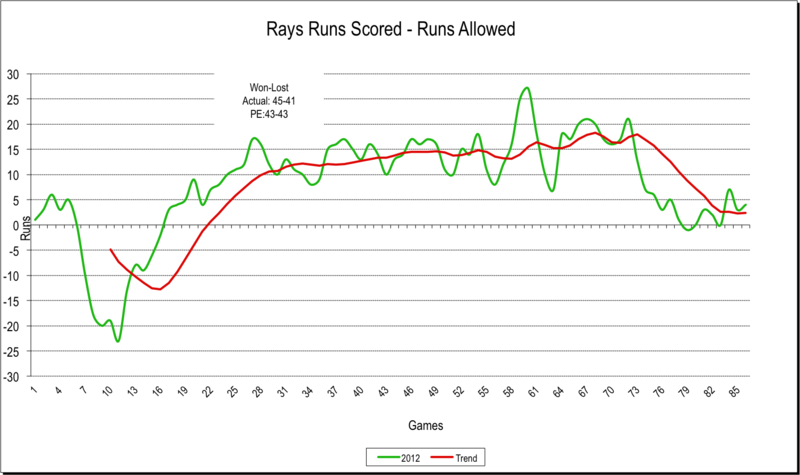 As with the Bulls, the Rays are performing above their PE expectation. Chris Archer left after one inning and Bryan Augenstein was pressed into service. He essentially took one for the team by going 66 pitches — he has rarely gone much over 20 per outing — but coughing up three runs in the 5th. Nevertheless, the game was essentially lost on bad luck. A long ball drifted fair instead of foul in the bottom of the 8th and that was enough. Let’s call this a game where the Durham Bulls showed their character. This was the last game before a three-day break, the only real break in the entire season, only 3,000 folks in the stands, 91°, and your starting pitcher blew up in the first inning giving up 5 runs on 6 hits. So what you could do is take it easy, get through the afternoon, and hit the road. They didn’t. They scored three runs in the 2nd inning on a Reid Brignac home run. Unfortunately, Lance Pendleton’s awful day wasn’t over and he gave up three runs in the 3rd. Braves 8, Bulls 3. Now maybe time to coast, but they didn't. In the 5th the Bulls pick up four runs on home runs by Rich Thompson, Henry Wrigley and Chris Gimenez. Braves 8, Bulls 7. The Bulls are getting close and the game is dragging on when the Braves get two runs in the 6th and one in the 7th. Braves 11, Bulls 7. Time to wrap it up, you’d think. But, no. Top of the 9th the Bulls get two more runs to bring it to 11-9 and the tying run comes to the plate with two outs. He (Brignac) struck out. But the Bulls gave the Braves’ fans a thrill and made them work for their win. If there was a bit of “what the Hell, go for it,” in their swings, why not? It almost worked. Chris Archer’s departure after the 1st inning of Saturday’s game is reported to be cautionary resulting from a tightness in his left oblique. But he is going to get a couple of extra days off as the Bulls are going to use the All-Star break to reset the rotation. 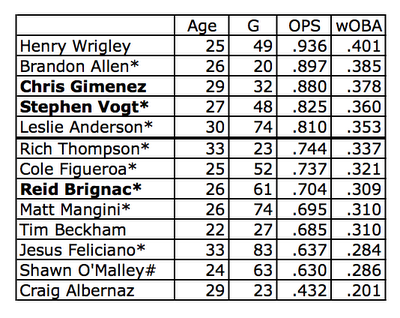 Stephen Vogt was name the top Ray's minor leaguer for the month of June. Congratulations! BurGi over at Rays Prospects has an updated analysis of pitchers in the Rays system. Terrific work. Note the discussion of Alex Torres in the comments. Matt Torra does not get the buzz of his teammate Chris Archer, but he is having one heck of a season, particularly the last several games. He had a brilliant night giving up only one run on just four hits. The home run points out his one shortcoming, giving up the big ones. That in turns drives some of his other stats. 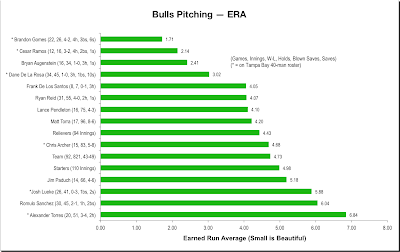 Nevertheless, he’s got the most innings of any Bulls pitcher, the most wins, and (for the 2012 Bulls), a decent ERA. Will he get a chance in September? Worth thinking about. And Archer's on today. Looks good for the Bulls. In the meantime, the Bulls jumped on Todd Redmond (is he ever going to go up to Atlanta and stick there?) for three runs in the first. That was enough. Leslie Anderson homered in the first inning and then was given two intentional walks. Guess he's got Gwinnett convinced he's dangerous. For those who listen to the game and have this year’s schedule at hand … the time of Sunday’s game against Gwinnett has been changed to 2:00. So if you crank up your radio for a 5:00 pm start, the game might be over. Why? Well, probably so that everyone except Leslie Anderson and Dane De La Rosa will be able to get planes and trains just a bit earlier. Anderson and De La Rosa are heading back to Buffalo for the All-Star Game on Wednesday. Everyone else has a break until Thursday’s game in Fort Mill, South Carolina against the Knights. The fundamental weakness of the 2012 Durham Bulls — pitching (especially starting pitching) — was re-exposed last night. Decent hitting simply wasn’t enough to hide it this time. We Bulls fans are simply shaking our heads over Alex Torres this year. Last year it was the huge BB and K numbers of the young man. Our view then was that if he could keep the Ks up and drop the BBs then the Bulls (and the Rays) would have themselves a pitcher. But this year all seems to be in confusion. Torres had five starts to begin the year, the last three of which were just awful, only a total of 8 innings and 17 earned runs given up. So he went to the bullpen, from which he made 11 appearances for 10 innings and 11 more earned runs. He had a decent start on June 19th (and a win). He went up to sit on Tampa Bays’ bench for a couple of days (was that meant to be a motivational gimmick?). He came back to a relief appearance, another pretty good start on June 30th, and then last night’s three inning, 62 pitch mess. Today at 20 appearances he’s got a FIP of 4.75 and an ERA of 6.84. I have to take the baseball gurus word that he’s a “prospect”, but he isn’t helping the Bulls this year. Then Ryan Reed ended up facing a very experience pro in Norfolk’s Bill Hall in the 5th inning with two runners on and a 3-0 count. Not pretty. Hall’s home run put the Tides up 7-3. The Bulls got two runs back in the 6th on small ball, although they left two runners on base (as they had in the 5th). Norfolk led 7-5 until Romulo Sanchez imploded in the 8th giving up three runs on a single and back-to-back home runs. I haven’t mentioned the extraordinary job that the DBAP folks have done with the scoreboards this year. If you pay attention, they can really keep you in touch with the game. Live updates of batting and pitching stats (including pitch counts); a recap of in-game performance each time a batter comes up; and more. Great job. I missed this when it happened. A $4,400,000 shirt! A couple of days ago Reid Brignac went 0-5 with every single ball he hit going to the opponent’s first baseman. Last night when he came up in the 2nd inning with runners on first and third and did it again, I thought he might be in for another game of the same. I was wrong. What he did after that was pop a single, an RBI double to the right field wall, and a three-run homer over the Blue Monster (and raise his average to .232). Great night for him and for a bunch of other Bulls. A huge crowd on hand, mostly waiting for the city fireworks show. While they waited we got to see some terrific baseball. Jim Paduch came back from his horrible outing last week to give up only the homer in the 2nd inning. Otherwise, he kept the Tides guessing for five innings. Cesar Ramos is reported to be on orders to be “stretched out”. Meaning, I guess, that he throws the ball a bit more than usual. He stayed for 2 innings and got the win when Brignac doubled home Leslie Anderson in the 6th. Dane De La Rosa got through two innings on 17 pitches. That’s efficiency. Meanwhile, Tim Beckham continues to assert himself at bat with a home run to begin the game. Rehabber Matt Joyce started in right field, but left after three at-bats. He was caught stealing after a walk. Not quite sure why he tried. The Tides’ Berken is famous for not letting folks steal on him. He was also in his major leaguer’s batting helmet. Those guys really don’t like the helmets required everywhere else. Henry Wrigley continues to hit very, very well — two singles and a double. Two nice double plays, 6-4-3 and a 1-6-3 that preceded the final K to end the game added to the fun of the game. Minor league trivia: The Bulls last played the Tides on May 27th, in Norfolk. From that game only four Bulls players and four Tides players were in last night’s starting lineup. The N&O has a nice story on Chris Archer's major league debut. Sometimes the box score tells you the story. Sometimes it misleads you. Not that the Bulls were cruising in last night's uncertain weather, they weren’t. But Lance Pendleton did a decent job through six innings and Bryan Augenstein held on very nicely for two more. In the meantime the Bulls scored two in the 7th and two in the 8th and were looking good for Brandon Gomes to close it out. What the box score does not tell you is that the bottom half of the 9th inning took a very long time to play, had only two outs, and was possibly the worst two-thirds of an inning in Shawn O’Malley’s and Brandon Gomes’ year. O’Malley came in as a pinch runner in the 8th and stayed in the game at second base. Gomes started the inning off with a walk, but seemed to recover when the next batter popped out. The next batter grounded to short and it sounded like a double play was going to end the game. But after making the out at second O’Malley threw the ball away and the batter ended up on second base with two outs. Gomes wild-pitched the runner to third base and the next batter hit a grounder to O’Malley who could not close the deal. The runner on third scored and a runner was on first. He moved to second on a single and they both moved up on another wild pitch by Gomes after he was ahead 0-2 on Bison batter Jordany Valdespin. Runners on second and third, scored tied, count 1-2, and the skies opened up. The umps cleared the field. When they got back, Frank De Los Santos came in to pitch, runners were still on second and third, and the count was still 1-2. An infield single (again to O’Malley) brought in a run. Game over. Overall, that was a great road trip. Only two home games and then the Bulls are gone till the 16th! Leslie Anderson got picked up for the Triple-A All-Star game! Congrats to Leslie! Matt Joyce, who did a terrific job for the Durham Bulls in 2009 and 2010, will be back in town for a rehab stint tonight and tomorrow.